Teaching personal finance can be a challenge especially if you have all the old, outdated resources that emphasis doing just about all your budgeting, check writing, goal setting, etc on paper. Students start the eye roll as soon as you hand out the “how to write a check” worksheet. Granted, they should know how to fill out a check even if they only use their debit card now. The world is changing and we want students to be turned on to being good financial stewards. This means we need to help them find technologically advanced ways to keep track of their spending, budget, and set goals. 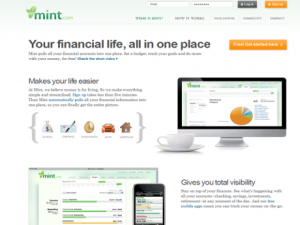 One of my personal favorite free personal finance websites is Mint.com. Whether you can require it or not is your discretion but I definitely spend some time introducing students to sites like this that make all the stuff we do on paper so much easier and practical for this technologically savvy generation. Connects to your checking account, credit card account, etc. Most students these days have their own check account and/or savings account. I believe as time progresses that more and more students will have electronic banking. Depending on your situation you may or may not feel comfortable allowing your students to use Mint.com for a class assignment. I usually give my students the option to keep track of spending in a journal or via one of the many online budgeting programs. You can also have their parent’s sign an authorization form so they are aware what their student is doing. This is also a good time to remind students to check the security of websites that they are giving their financial information to. Every transaction is listed and it categorizes most of the major retail stores, restaurants, etc. for you. The rest like checks, etc you can categorize yourself. You can be as specific or generic as you want. For example you can have a eating out category or an entertainment category. You can set goals for your spending and have an email alert you if you go over your spending goal. With all the smartphones available this information is instantaneous and helpful in making financial decisions even in the store! It also shows you the progress towards long term goals such as saving for college or a car. You can allocate money to that “category” and track your progress visually. Recommends products to help you meet your goals. 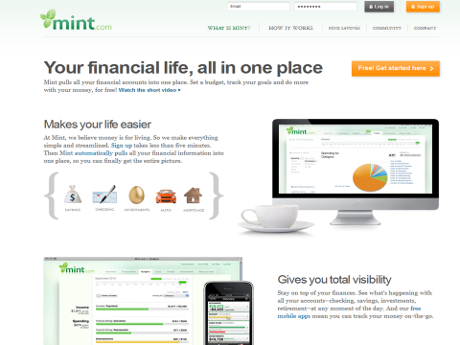 This is how Mint.com stays free – it sells advertising of financial services and products to companies. Then you can see in the recommendations tab things like credit cards that offer cash back, etc. I like to teach students about financial advertising as well. It is important to look into any financial offer, read the fine print, and investigate alternatives. I have done this lesson in my classroom, only I used marshmallows and toothpicks. Great idea with gumdrops and spaghetti.